Get Covered for 4 Full Years! Now you can order Tires, Rims, Complete Sets or Tire Repair right from our new Mobile Golf Cart Tire Service. Don't just take our word for it, check out these Independent Views from around the web. 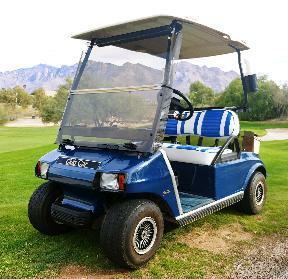 • What is the best Golf Cart Battery? With over 80 years of experience, Trojan Battery delivers the world's most trusted deep cycle batteries for use in golf cars, utility and neighborhood electric vehicles (NEV). Try Our New, Easy to Follow, Online Scheduling System for New Batteries, Service or Repair! * 1.5 % charge on cc transactions. The way we streamline our mobile business with the most advanced technology helps us to reduce our overhead and pass the savings on to you. Adding to that our unbeatable purchasing power due to our high volume of sales, also allows us to be the most competitive dealer in the Tucson area. We come to you. We remove your old batteries, clean your battery compartment with electric scrapers and brushes, paint your battery tray, replace your battery cables with new heavy duty 4 gauge cables, install your new batteries and check out your charging system. And your golf cart never leaves the front of your home or business. If you Need Batteries? Try our New Online Scheduling System. Nobody Beats our Price, Service or Warranty. And now recieve a new set of Heavy Duty 4 Gauge Cables with every install. We decided that if you're going to install brand new batteries you might as well get brand new cables. We have the best Extended Warranty in the industry. We cover shorted cells, dead cells, damaged battery posts, damaged battery cases and any bad cables at time of replacement. Also diagnostics and labor. All for $19.95. *All Warranties "2 Year Free Replacement" and "2 Year Extended" are non-transferable unless approved by The Battery Guy Tucson.. 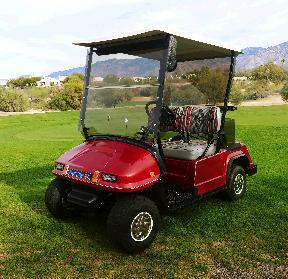 Looking For A Used Golf Cart? Check out our new site! Need Batteries? Schedule on Line. We Only Sell Trojan Batteries and We Have The Best Deals In Tucson! We remove the old batteries, clean and paint the compartment, replace the cables with new heavy duty 4 gauge cables, seal the connections and check your charging system. Check Out Our Brand New Scheduling System. Now you can Schedule What Day and Time and we come out. Battery Installs, Battery Checks, Golf Cart Repair, Annual Inspections, Tires what ever you need. We are Hiring! Looking for experienced golf cart technicians and battery installers. 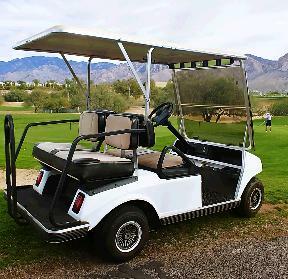 Call now and get in on the ground floor of the fastest growing Golf Cart business in AZ.